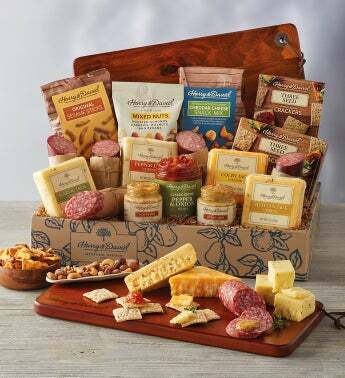 When it comes to meat and cheese gifts, it makes sense to find one filled with the best gourmet selections. Our Ultimate Meat and Cheese Gift brims with delights from the Pacific Northwest and beyond, including garlic and Colby Jack cheeses, smoked summer sausage, and hot honey mustard, along with savory accompaniments like dry Milano Italia salami and a gourmet nut mix. This gift also includes an acacia wood cutting board for a distinctly elegant presentation.